Pattaya began moving and rewiring Walking Street signs found to be hanging too low to allow firetrucks to pass underneath. 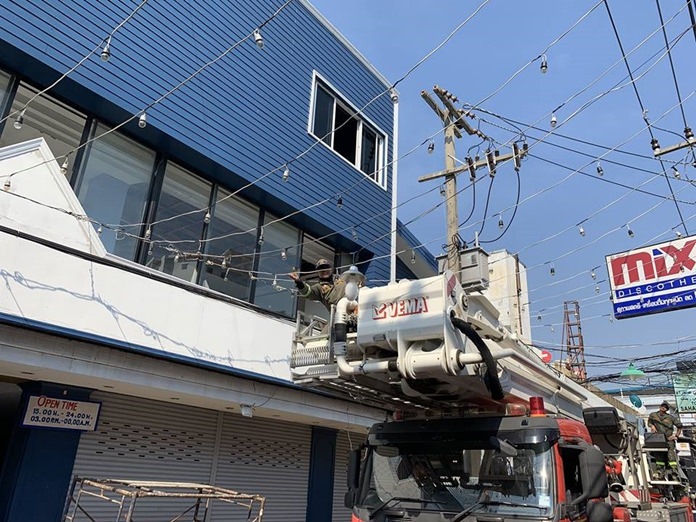 City officials said all the affected bars, shops and restaurants cooperated with requests to remove low-hanging electrical and utility lines attached to their buildings by Dec. 21. Work crews also began relocating signs to provide five meters clearance to emergency vehicles. City hall requests that sois 14, 15 and 17 remain free of parked vehicles and motorbikes through Jan. 2 to allow emergency vehicles to access Walking Street during the busy New Year’s period. All emergency services will be coordinated through a temporary command center at Bali Hai Pier during the holiday.